The whole process, laid out in a clear, easy to follow way. The best process for taking panoramic photos took me years to learn. Through extensive trial and error, countless on-site excursions, software trials, and equipment switches, I finally honed in my technique for capturing a massively detailed and high quality stitched panoramic image. I have decided to describe in detail the step-by-step process for how to achieve this, so that you can attempt to replicate the process and capture your own stunning stitched landscape panoramas. This may seem relatively self-explanatory, but it is often taken for granted how important it is to carefully select not only the subject matter of your shot, but the place where you will be shooting from. Say for example you want to capture the San Francisco skyline as in the above picture. This same view looks incredibly different depending on where you attempt to get the shot from. For this shot, I drove across the Bay Bridge to Treasure Island at least four times before I found the ideal position, angle, and lighting conditions to make this shot all that I wanted it to be. Positioning myself slightly closer to the bridge makes the bridge a much more prominent feature in the final shot, and offsets the composure for what I was trying to accomplish. These kind of choices almost entirely come down to preference, but it is important to keep them in mind in order to capture the panoramic image you are going for. It is not that this shot would have been impossible without a good tripod, but I cannot imagine being able to achieve the results that I did without one. It can get pretty windy on the bay, so I climbed out onto the rocks by the water, and chose not to extent my tripod legs in order to increase stability. I attached my Nikon DSLR with my 70-200 f/4 lens, and rotated the tripod ball-head to portrait view (vertical). It is important to make sure that you will be able to rotate the camera body along the x axis without changing or adjusting anything else on the camera or tripod – the goal is create an even plane by which you can move the camera’s view. My tripod has an adjustable baseplate, so that you can easily rotate the whole setup without disruption. Lastly, I plugin my shutter-release remote, to reduce camera shake from pressing down on the shutter. You can check out my whole photography equipment list. Because this shot is taken at night, you will likely have an extended exposure. This doesn’t necessarily have to be the case (you can offset this with ultra high-ISO and wide open aperture), but the smooth water effect I was going for is only enhanced by a slow shutter speed. After some trial and error, I found my best settings: shutter speed: 15”; aperture: f/6; ISO: 100. In terms of file format, I only shoot in RAW (and you should too). It is very important to set everything to manual, in order to keep your settings consistent across the various frames that you will be shooting. Remember that my goal is maximum sharpness, and because I am willing and able to have a really slow shutter speed, there is really no reason to compromise on either my aperture or my ISO. This will obviously vary depending on the situation and lighting conditions. It’s also crucial to set your auto-focus off, so that you maintain an even depth of field for the final image. Take a few test images, and then use the viewfinder to zoom all the way into the image. This way you can determine if you are at optimum focus for your subject matter. This is a crucial part of the process that often gets overlooked or ignored. In order for the panoramic stitching software to be able to accurately match up the pixels of your images, you will need to overlap your areas of exposure by approximately 1/3 of each individual photo that you take. When everything is set and you are ready to shoot, take the first image at the farthest end (I shoot left to right) using your shutter remote. Rotate the camera on the tripod's swivel head so that in the new frame, you overlap by 1/3 of the previous image (see image below). I recommend repeating this process multiple times to ensure that you get the results you are looking for. So you've got your individual shots, and you are super excited about it. You should be, but there is still lots to do. Open up your RAW files in your preferred photo editing software. I use Adobe Lightroom, and love it. It allows you to open one file in a series, make all the preferred general edits, and then apply those same edits to the whole series. Remember you have to be consistent for all the photos that you are stitching together. Then export the series as high quality TIFF files into a designated folder. This is the hardest part for most people, and for good reason. If you think for a second how complex of a process it is to perfectly match up pixels taken from two different images, and have it be as seamless as possible, it’s astounding that we are even able to get the results that we do. To date, the best software for stitching panoramas that I have found is the newly release Lightroom 6 in the Creative Cloud. Adobe Lightroom's panorama stitching feature is an amazing piece of software. The pixilation detection engine perfectly matches up my individual shots every time. Keep in mind that this is not a wizard’s tool: it can’t bring together images that weren’t taken with the same settings, or if you have a gap in your overlay and are missing part of the scene. That being said, it definitely does seem to work magic. The other great alternative is to use Autopano Giga by Kolor. So now you have a (massively) large stitched panoramic photo, and you're almost done. Import this new file back into Lightroom, and make any final edits to the overall completed image that you want. Export as a JPEG in order to have a more manageable and useable final image file, and voila, you have created an ultra high quality stitched panoramic landscape photo. If you're like me, you want to be able to upload and share your work to the world, but Facebook just doesn't cut it. I chose to host and share my photos on SmugMug, by far my favorite website hosting platform that I have found. They have great affordable options for displaying your photos on a custom or template design, and they even allow you to sell your photos directly from your site. Click here to start your free SmugMug 14-day trial today, and save 15% on a subscription. Another fantastic option for creating your own stunning website and showing off your beautiful images, is Wix. Wix is a much more user-friendly and easy to use website builder, with simple drag-and-drop design blocks that actually make it fun. You can see the more in-depth reviews and comparison of photo hosting websites here. Check out the best selling landscape photos page to see more examples of awesome panoramic photos. If you found this helpful share on Facebook or your favorite platform. Or tell us what you think in the comments below. Justin Katz has spent the last twenty years developing his love for outdoor photography. He thinks it's pretty weird writing about himself in the third person, but admits it sounds slightly more epic. 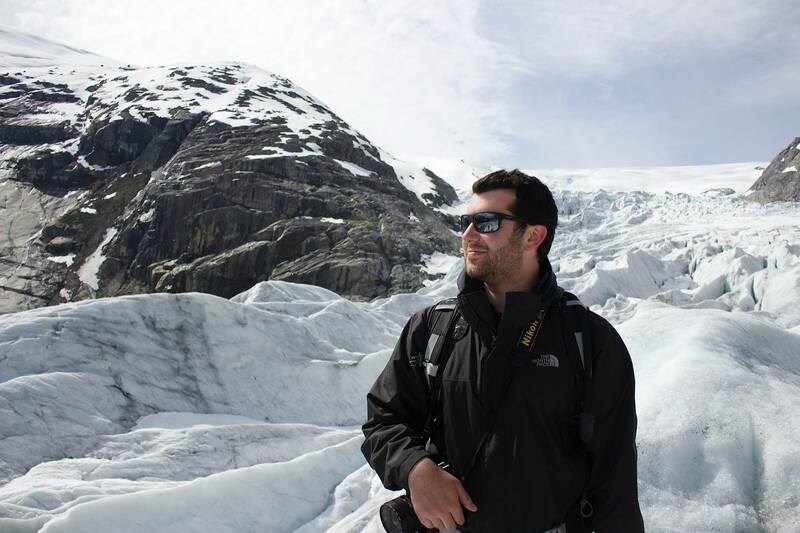 He lives in San Francisco, but likes to hike glaciers in Norway.